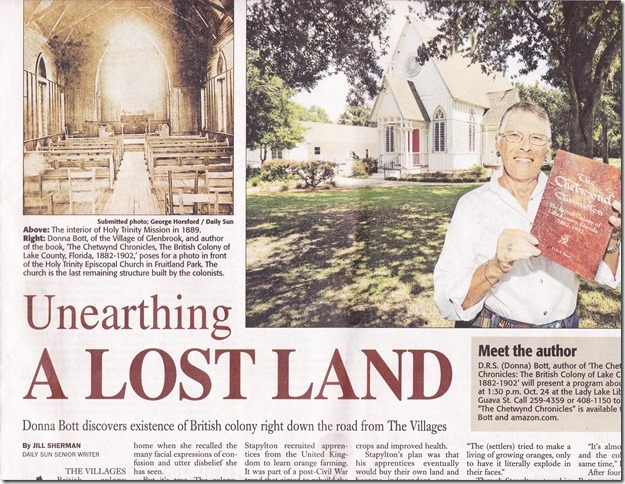 Jill Sherman, a senior writer for The Villages Daily Sun, thought her article about Chetwynd would publish last Tuesday. So imagine my surprise when the first email I saw early the morning before was headed “WOW!” Jo’s message sent me flying out the door in my jammies to fetch my paper and to verify the “grandness” of the article of which she wrote. Jill’s skillful writing, along with nine pictures, not only summarizes my work and story but is far beyond my wildest expectations in terms of length—just short of two full pages. One reader said that he was prepared for a paragraph or two on the continued page rather than two-thirds of a page. Anyway, I loved the emails and phone messages and phone messages left while I was—you guessed it—playing golf. Jill said the article was the “talk of the office.” It was also the talk of The Villages radio station although I didn’t hear it. As for television coverage? The afternoon of the photo shoot at Holy Trinity Church I was told that the photographers (note plural) were back in the school parking lot. Sure enough there was George who I had once encountered when the church was vandalized along with John who was removing a TV camera from the back of a SUV. John was mystified about his “work order”—something about a colony called Chetwynd that he thought was up north somewhere. “Let me see the cover,” he kind of barked. I held it out. “Oh my God; you mean it was right here? In Lake County?” Now whether his interview with me ever ran, I haven’t a clue. But I’ll never forget John’s reaction.